The picture shows an exquisitely preserved and previously unpublished object from the 1976-1980 excavations at the Alvastra pile dwelling. It was found in Mats Malmer’s eastern trench. Like several other fishing hooks from the older excavations, it is made of boar tusk. In his writings on the pile dwelling Mats Malmer maintains on several occasions (for example in Malmer 2002) that these hooks are not strong enough to be of functional use. When I talked about these fishing devices at the international open workshop entitled Socio-environmental Dynamics over the last 12000 years organised by the Graduate School of Human Development in Landscapes at Kiel University last spring, I got the distinct impression that this was not a view endorsed by the archaeologists gathered at the session on fishing communities and technologies. Indeed, Hans Browall’s idea is that these hooks were used for catching small freshwater fish (Browall 2011, p. 324). The fish remains recovered from the excavations were studied by Ebba During (1986). They consist mainly of freshwater species even if some of them (for example pike) also live in the brackish water of the Baltic. Those who used the pile dwelling had access to fishing in the waters of Lake Vättern, Lake Tåkern and a large number of small streams in their vicinity. During the Middle Neolithic the pile dwelling was about 70 km away from the shores of the Baltic. Thus finds of 20 scales of herring in the 1911 excavations provoked interest, Bo Gräslund writing an article about them (Gräslund 1978). The scales were analysed by a Norwegian specialist, Einar Lea, and his results are discussed by Gräslund. In his latest book on the pile dwelling Hans Browall suggests that these scales may not be prehistoric at all as they come from herring that are much larger than the average Baltic herring of today (Browall 2011, p. 336). The scales also show that the herring from which they came grew as fast as modern herring in the North Sea and the North Atlantic. Unfortunately the scales cannot be found in the storerooms of the museum so no new analyses can be conducted. Browall, H., 2011. Alvastra pålbyggnad. 1909-1930 års utgrävningar. Kungl. Vitterhets Historie och antikvitets akademien. Stockholm. During, E., 1986. The fauna of Alvastra. An osteological analysis of animal bones from a Neolithic pile dwelling. Ossa, vol. 12, supplement 1. International journal of skeletal research. Stockholm. Gräslund, Bo., 1978. Sill och sillfiske i Östersjön under stenåldern. Tor, vol. XVII. Uppsala. Malmer, M., 2002. The Neolithic of South Sweden. TRB,GRK, and STR. The Royal Swedish Academy of Letters History and Antiquities. Stockholm. min uppfattning av Frödin är att han var mycket noggrann vad gäller utgrävning (till ex hans undersökning av Ånneröd i Strömstad år 1905, tillsammans med Gustaf Hallström). Jag tror inte att strömmingfjällen var sentida inblandning. Det finns (och fanns) många olika bestånd av strömming/sill i Littorinahavet/Östersjön, med olika tillväxthastighet. Jag har i min egen samling av fisk från Östersjön s.k. sillströmmingar som var 40 cm långa, fångade vid Oxelösund. Fjällen i Alvastra kan mycket väl komma från sill/strömming som fångats i Littorinahavet. Thank you very much for this comment too. We will have to make renewed efforts to find the scales in our storerooms so that they can be subjected to a more modern analysis. Jag har själv inte haft möjlighet att studera krokarna från Alvastra. Jag har alltid varit skeptisk till att de skulle vara gjorda av svinbetar. Dom borde granskas igen. Thank you for your interesting comment. I hope you don't mind if I answer in English. We are trying to let non-Swedish speaking colleagues in on the discussion. 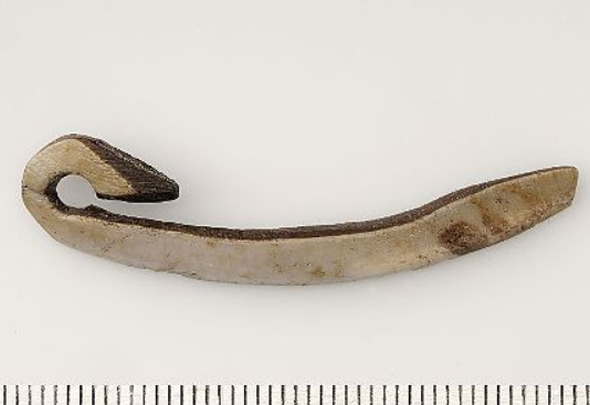 There are apparently also fishing hooks of boar tusk in the Middle Neolithic graves of Gotland and in the material from Hindby mosse in Scania. It has never occurred to me to be doubtful about the material from which the hooks are made. The material certainly looks like boar tusk but I will ask an osteologist to take another look at them. Please get in touch if you are in Stockholm sometime and we will be glad to show you the Alvastra hooks.